Function generators are commonly used for lab bench testing. For some lab testing and scientific experiments, these commonly available function/signal generator output voltage is about +/-5V into a 50 ohm load. For bench test applications that required higher voltage, a signal generator amplifier is needed. As shown the Figure 1 below, the function generator output is connected to the high-voltage amplifier input. By combining the signal generator and the amplifier it forms a high voltage function generator. Figure 1. Combine TS250 Waveform Amplifier to makes a high-voltage function generator. Conventional signal generator output resistance is 50 ohm. This 50 ohm output resistance severely limits its output current to about 100mA. The TS250/TS250 amplifiers has very low output resistance (~50 mOhm). Their output current is up to 6A, depends on the model. See the Selection Guide below for output current and voltage range. Using a waveform generator and an amplifier combination (Figure 1) offers flexible output power/voltage/current over a single unit high voltage signal generator for many bench testing applications. Another use for using external driver amplifier is it can increase the output current by connecting multiple amplifiers in parallel. Very high current is sometimes necessary for some experiments such as driving magnetic coils. As shown in Figure 2 below, 2 or more TS200/TS250 high-voltage amplifiers can be connected together to increase the output current. To connect amplifiers outputs together, small resistors are needed to isolate high-current amps from each other. 0.3Ω to 1.0Ω series resistance is typically used. For higher output voltage, use larger resistance. Since the output is high current, the resistors must be rated for high power dissipation. Figure 2. High power function generator uses two TS250 drivers for higher output current. Some test applications require high DC bias voltage. In such applications, this requires high DC bias voltage, but low DC current. For example, in power supply ripple testing applications, the DC input may be up to 100V, but the input ripple voltage required for this test is only 1Vpp. The unit under test (UUT) has large input capacitance and at high frequency (100kHz), it will required +/-6A current. To fulfill this requirement the function generator must be able to output 100V and 6A. You would need a signal generator that can output 600 watt power. By the use of the TS250/TS200 Waveform Amplifier and an isolated DC power supply, a high-current and high voltage function generator is achieved. As depicted in Figure 3, the high-current driver amplifier is series connected with an isolated power supply. The TS250/TS200 driver’s negative terminal is connected to the system ground. The system GND node is in common with the function generator GND as well as the UUT ground. The AC waveform driver’s positive terminal is connected the DC power supply’s negative terminal. Lastly the DC power supply’s positive terminal is connected to the unit-under-test (UUT). The voltage seen by the UUT is the VDC plus VAC voltages. DC power supplies have internal capacitors. Adding additional external bypass capacitors is recommended. This is especially true for high frequency waveform. Multiple capacitors with various capacitance that are connected in parallels offer better frequency response. Using low ESL and ESR ceramic capacitors is the best, but a combination of tantalum, electrolytic, and ceramic capacitors are okay. The external bypass capacitance must be high enough so that its impedance is at least ten-times lower than the UUT input impedance. To produced the required waveform, the external isolated DC power supply is used to set the DC or nominal voltage. The amplifier driver produces the AC voltage signal. The AC amplitude is set by the function generator and the TS250/TS200 gain. For instant, a piezo transducer requires a 100V bias DC voltage as well as a 80Vpp sinusoidal. This is same as 60V to 140V sinusoidal swing voltage. This is accomplish by setting the external DC voltage to 100V, set the TS250 gain to 20dB, and set the function generator voltage to 8Vpp (+/-4V). In conclusion, by using the test setup in Figure 3, it is equivalent to a very high power function generator. Figure 3. 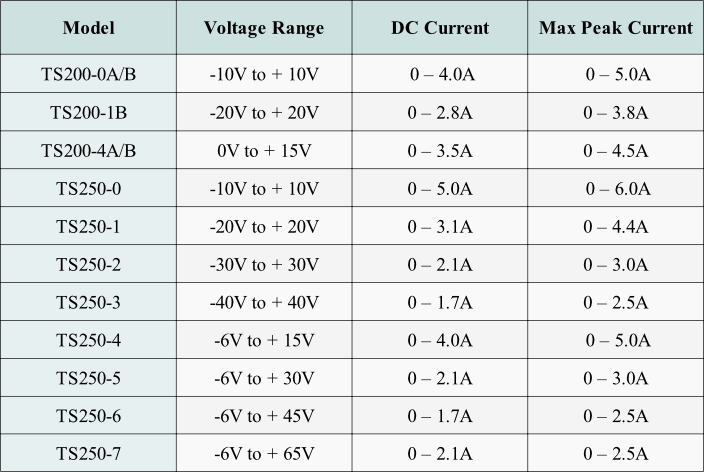 Using an external isolated DC power supply connected in series with an high-voltage amplifier to produce high DC offset voltage. The TS250/TS200 are designed to interface with most function generators as well as signal generators. These high voltage function generator amplifiers inputs are using BNC female connector. They use standard 50-ohm coaxial cable to connect to function/signal generators. Table 2 shows a few recommended function/waveform generators. Figure 4. Generate High voltage signal using transformer for driving piezoelectric transducer. Some test applications such as piezoelectric driver driving transducers requires even higher voltage that are 200Vpp or more. To further boost the voltage, the simplest way is to use a transformer as show in Figure 4. The transformer's turn ratio is chosen such that the output voltage met the piezo voltage requirement. The advantage of using transformer not only boost voltage, but also no reduction in bandwidth. It is best to use ferrite core transformer to avoid Eddy current loss, especially at high frequency. Turn ratio up to 1:10 may be used. The capacitor is added to filter out any DC offset voltage from the amplifier. Caution: Transformer output is high voltage and may became electrical shock hazard. Must use high voltage handling techniques to avoid the risk of electrical shock. A amplifier such as the TS250/TS200 offers the flexibility to choose voltage from +/-10V to +65V. In addition to high voltage, these high-current amplifiers feature high output current up to 6A. Conventional function/waveform generator output resistance is 50 ohm which limits the output current. The test setup in Figure 1 can output high current as well as high voltage. Because the TS250/TS200 waveform amplifier can output up to 70 watts of power, they can also do the job of a high power function generator for heavy loads. In conclusion, the above mentioned method of combining a high-voltage amplifier and an arbitrary waveform generator offers many advantages over a single-unit high voltage signal generator. As shown in Figure 1, the function generator signal output is amplified. Our amplifier drivers are capable of amplifying voltage, current, or power, or any combination. For example, if the test application requires a 40V pulse while driving a load of 1A or 40 ohm. In this case, voltage, current, and power are all amplified. When the amplifier/driver is configured for a gain of 20dB (gain factor of 10V), a 4V pulse at the input will resulted in 40V at the output. Therefore the amplifier approach offers more flexibility to implement a high voltage signal generator.